Premier Luxury Suites offers the best price on extended stay lodging Chicago suburbs options that you can find within the Chicago area. We have the affordable rates that make it possible to feel at home, while you're traveling rather than staying at a cold hotel. We understand how big a difference it can make in your well-being and performance to have a relaxing place to call home with the opulence and amenities that make business travel worthwhile. At Premier Luxury Suites, we appreciate the benefits of having a place, where you can entertain, conduct business, or just make a home-cooked meal. This is just one reason why we ensure that we have the best price on extended stay lodging Chicago suburbs travelers prefer. There are a lot of reasons why people visit the city of Chicago and the surrounding area. Business professionals and employees that are being relocated want more than just a hotel room for a long-term stay. When an employee is relocating, it can be a very stressful time. You want your employees to feel comfortable while they are away from home or waiting to move into the perfect house for their new life. However, you also need to consider the expense involved. Premier Luxury Suites can help with the best price on extended stay lodging Chicago suburbs facilities that provide everything your relocating employee or visiting professional could need. Our new buildings include all of the amenities of home with a variety of luxury touches, including the ability to come home to a designer apartment with stainless steel appliances and high-quality furnishings. When you take advantage of the best price on extended stay lodging Chicago suburbs options with Premier Luxury Suites, you'll have happier more productive employees. 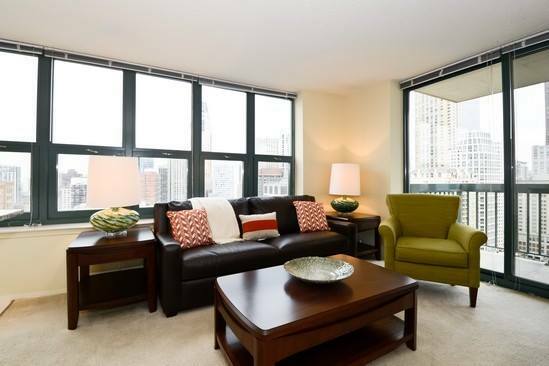 Premier Luxury Suites offers luxury corporate housing properties throughout the city of Chicago and the surrounding area. Some of the properties within Chicago include The Aqua and The Streeter. Our suburban options include: Kingston Pointe in Des Plaines, Northshore 770 in Northbrook, and Avant at the Arboretum in Lisle to name just a few. You will find Premier Luxury Suites' properties located within all of the best locations in Chicagoland. With Premier Luxury Suites, you can get the best price on extended stay lodging Chicago suburbs solution without sacrificing the desire for a great location. One of the most coveted aspects of our short-term housing solutions is the move-in ready, fully furnished aspect. You, your employee, or your client, can bring just your suitcase and have all the comforts of home from chef's kitchens to furnishings hand-picked by our designers. Fortunately, we do offer many of the same amenities you would have at home or a hotel, such as high-speed internet and cable TV. We can even receive weekly maid service with fitness centers and more, so it might be better than home in some ways. You can get all of these conveniences and still receive the best price on extended stay lodging Chicago suburbs visitors would get over a local hotel. Premier Luxury is here to help you with temporary housing.